It’s been months in the making, with huge amounts of planning and research going into expertly curating a collection with all the latest styles and on-trend fabrics for homes. The new Style Studio Roman Blind & Curtain Collection has just landed and it’s our most extravagant yet! With over 320 fabrics comprised of striking plains and eye-catching patterns, there is something to suit all tastes and styles of property. Even better, each fabric has been chosen to either stand alone or co-ordinate with others within the collection giving even more options for styling windows. 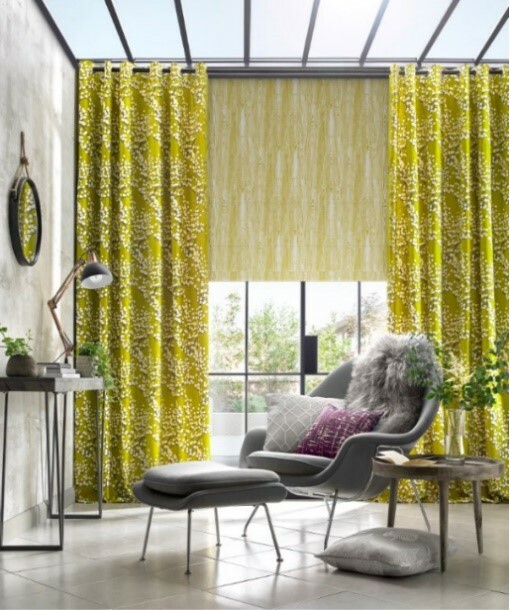 To help homeowners whittle down their choice, Lorna has also put together her four favourite looks below – not an easy task considering how many stunning fabrics are available. We’ve paired this with a Roman blind in Nevin fabric, which has a subtle wood grain effect, brought to life by the Sunflower colourway. A perfect pairing to add vibrancy to one of the most relaxing rooms in the home. Love this bold look? Why not try out some of your own daring pattern combinations using DesignSpace – which allows you to see and compare window coverings in a variety of rooms. Fabric with visual interest that goes deeper than simple surface pattern will be a huge trend in 2019. Layering and texture will be created within fabric weaves. Texture will also take the form of tufted, quilted material and cut out or raised effects with metallic highlights further amplifying these multi-layered designs. Elaborate embroidery, tasselling and decorative finishing on cushions, blinds, curtains are all big news. 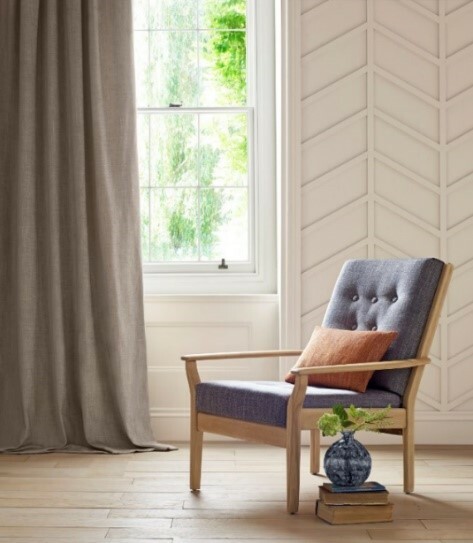 With over 150 plain fabrics to choose from in our new collection there’s something for everyone, from our soft, silky Oasis and sumptuous velvet fabrics, to linen looks and subtle, woven designs. This look is great for anyone who really can’t decide between patterns or plains. And for those who’re unsure about how to mix different patterns together. 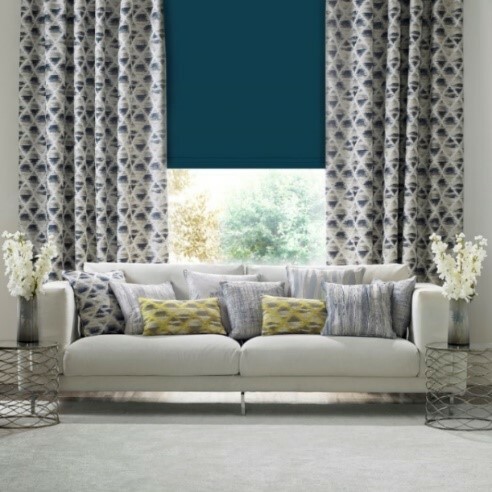 Introduce a bold design such as our abstract geometric Curtis fabric, then pick out one of the colours on a plain blind. 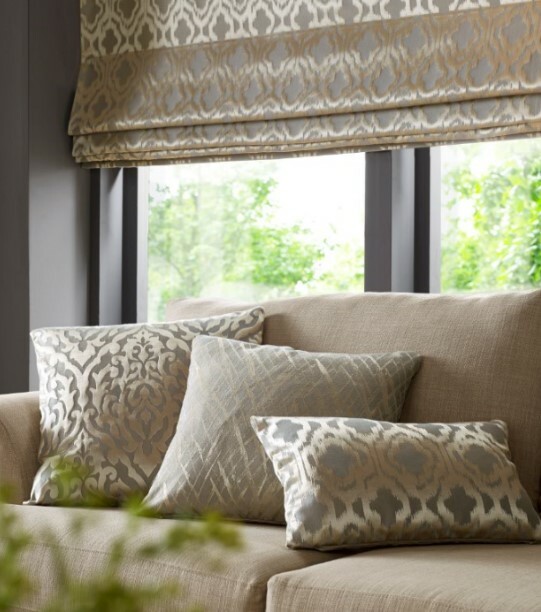 Any of our Roman blinds and curtain fabrics can be made into superb quality cushions – another affordable way to introduce pattern throughout the room. 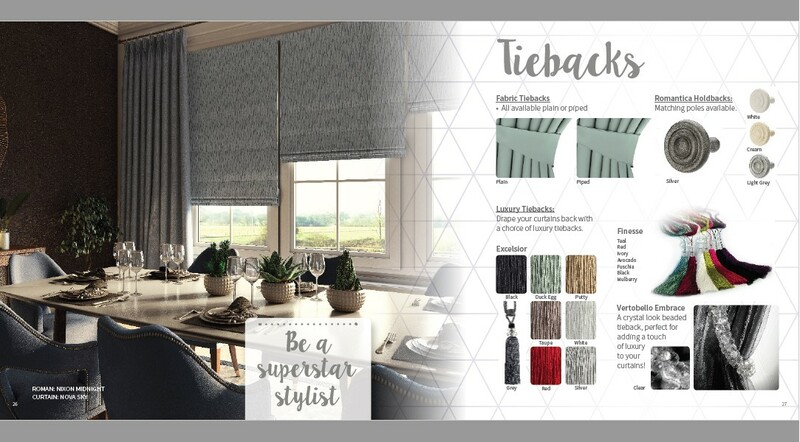 We might’ve mentioned our gorgeous quality co-ordinating cushions, but did you know that Style Studio also offers a range of tie backs and hold backs – either in matching fabric or with crystal or beaded embellishments – plus curtain poles and finials to complete your look. And with the new Powershade Roman blind motorisation system, Roman blinds can be controlled by the touch of a button either by remote control or via our NEW Smart Controller Smartphone app on iOS and Android. It’s even compatible with Amazon Alexa® and Google Home so if homeowners want to open or close the blinds all they need do is ask! Browse our new Roman Blinds and curtain collection here.